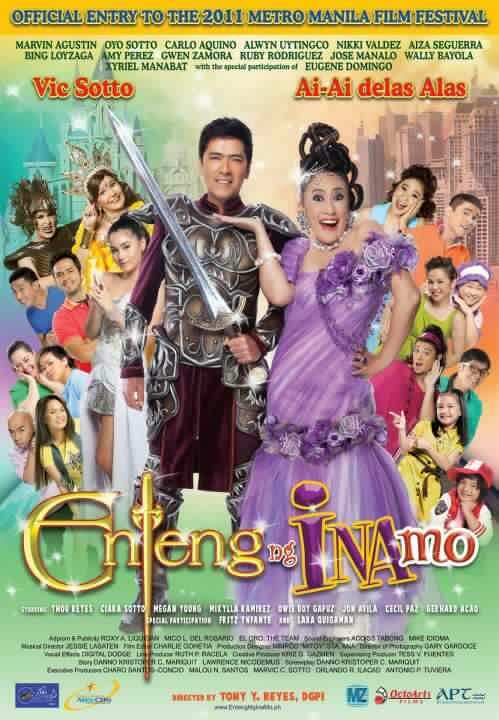 Eversince Vic Sotto made a “panata” to join the Manila Film Festival as Enteng Kabisote, it has been our family tradition during christmas season to arm wrestle our way inside the moviehouse to watch him, his gang and the engkangtadas do their thing on the big tube. We grew up watching Okay Ka Fairy Ko, and it is something from our childhood that my husband, sister and I cannot just simply let go yet. And eventhough my daughter, who is now 10, didn’t have the slightest idea before what Okay Ka Fairy Ko was all about, the fun experience that she had while watching her first Enteng Kabisote movie was enough to make her a fan. It is no wonder then that my family and I were one of the early ones who lined up today (of all days) at the box office just to catch the second run of Enteng ng Ina Mo, the merge of our two favorite blockbuster movies. What can I say, it was worth the arm wrestle. It passed up to our great expectations. My husband and I were wondering how the story would go and we were surprised that they were able to seamlessly merged the two story lines well. They were able to retain the general theme of the two movies, Enteng Kabisote’s victory of the good over the bad and Tanging Ina Mo’s family first over personal happiness. It was a great play of fantasy and reality. I love how the things that I love about these two movies are still very much evident such as the slapstick comedy of Vic, Jose, Wally and Ruby, the hilarious exchange of punchlines between Aiai and Eugene Domingo, the kabibuhan of Zyryle Manabat, the “katibuan” (oops) of Aiza Seguerra and “kabaklaan” of one of Aiai’s children which were both done in good taste (hint: watch out for the ending and the possible clue on what’s gonna be new in the next movie installment). I also liked how the two didn’t overshadow each other, the highlight of each the story lines were given equal importance in the movie. I missed the refreshing face of Khristine Hermosa though, to me she was still the best Faye after Alice Dixon and Tweety De Leon. I also would have loved it if Amy Perez acted more like her Face to Face self rather than a gentle Ina Magenta in the movie. G Tongi would have still been a better Ina Magenta, she is definitely in the league of Charito Solis. Ruby Rodriguez’s weren’t given much camera time too although her 3 minutes long appearance with Jose was pure laughtrip in its own right.